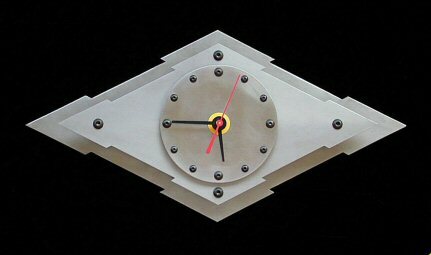 For quite some time I've been wanting to develop a design for an "industrial" looking shop clock for guys like us – something you'd never see in a store, and which looks like it might have been made by some long-ago machinist on a ship or in a mobile army workshop during WW2, without regard to how long it took him. The above photo shows what I came up with. At 13" across, this clock is big enough to be impressive, and you won't see anything like it in a store. The diamond-shaped frame plates are spaced 3/4" apart with shop-made spacers, and the dial is spaced another 1/8" or so out from the front frame plate. The spaces between these three parts make for an interesting 3-dimensional or shadow effect. I made the prototype you see above from 22 gage CRS sheet, cutting out the two spear point diamond pieces with a cold chisel, and then cleaning up the chisel cut edges by filing carefully down to my layout lines. The dial was cut close to finished size on a slitting shear, the edge was filed down to the layout line, and then the face of the dial was polished nice and smooth. Finally, the various holes were marked out and punched in all 3 pieces. amount of time I spent making the prototype. I chose to use screws for hour markers, instead of etching numbers on the clock dial, as this seemed simpler, and in keeping with the industrial look I wanted. The kit includes the dial and the 2 diamond-shaped frame plates; also screws, nuts, and a piece of 5/16"ø CRS. The 3 sheet steel parts are laser cut from stainless steel, and will need only a little work with a file to be ready to use. All the holes are laser cut, and should require no further work, beyond perhaps passing a twist drill of the next larger size through them. The clock uses a battery-operated quartz movement, which is supplied, as are a set of hands. The movement requires one AA-size battery, which is not included. To finish the clock, you'll only need to make the spacers - 4 little pieces of round CRS bar, faced to uniform length, and drilled and tapped 10-32 end-to-end, plus 4 little clearance drilled spacers for behind the dial. These 8 spacers are made from the 5/16"ø CRS material supplied in the kit. Obviously, this is not a demanding project - anyone with a lathe should be able to complete the kit in one or two evenings - but when it's done you'll have a distinctive clock that none of your friends will have. You can add any custom touches you might like, such as polishing the brushed stainless steel finish to a fancier appearance, before assembling everything. prototype, which is shown in the photo above. To see 4 photos of a clock I made up from one of these kits, click here. Two things to notice on these photos are as follows: first, that a photo editing function called "Sharpen" was used on them, which has caused the grain effect on the stainless steel diamond plates to be somewhat over-emphasized; second, that I fancied up the dial on this particular one to a certain degree. You can do something similar, or entirely different, if you want, or leave it plain. You can hang the finished clock on screws on the shop wall, mount it on a backing board, or make a stand for it. Kit price: US$75 + $5 shipping to destinations in the continental USA. Canadian Customers: Cdn$98 (including GST) + $9 for surface postage within Canada. BC residents please add $6.41 PST. (Canadian customers in the Harmonized Tax Zone deduct 7% GST, and then add 15% HST (or e-mail me for correct amount to send). Customers in other countries: Please e-mail us for shipping cost to your location before ordering. NOTE: Please put your e-mail address on your order, so I can e-mail you the instructions for completing the clock. Click here to go to my home page. Click here to go to my "clockplans" page. Click here to see a clock built from this kit by one of my customers.